Summer might be over, but this beautiful "Summer Collection" of products from Be a Bombshell Cosmetics can easily take you into Fall and Winter! Also, these Summer Collection items are still available on the Be a Bombshell site! 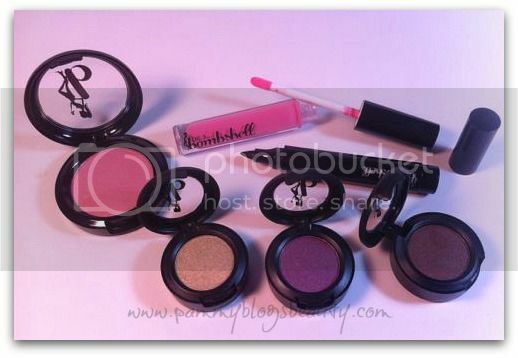 I am always excited to get a new assortment of cosmetics from Be a Bombshell! 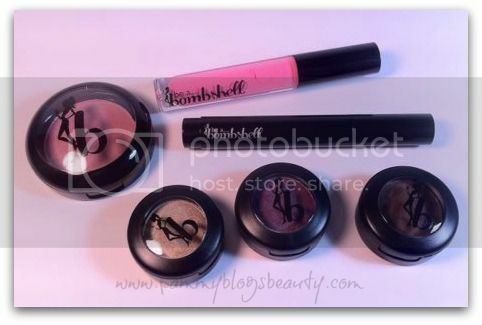 Awhile back, I reviewed this assortment of products: Be a Bombshell: Cute Stuff! I really like the philosophy behind this brand. At Be a Bombshell, they believe that every woman is beautiful and they want you to enhance your own natural beauty. 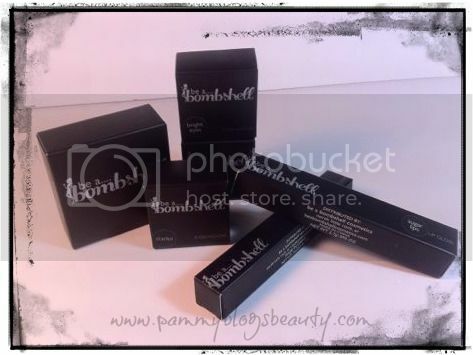 Be a Bombshell is a cosmetics brand offered on a somewhat personalized online shopping site. Each month they email you with product assortments and collections. You can opt to purchase items individually or go for a collection (various price points:2 for $19.95 or 3 for $29.95). What a great price for good quality cosmetics! There is no obligation to buy month-to-month. If a collection appeals to you, you can purchase it. If not, no worries. You do not have to buy! 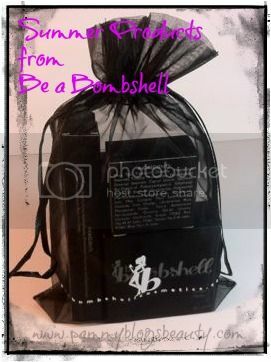 I really love the quality, packaging, and assortment of products offered at Be a Bombshell! To see more of this Summer Collection, keep reading for photos, swatches, and Face of the Day! New "Sizzlin Summer" Products from "Be A Bombshell"
"Be a Bombsell" has an option on their site to shop by the "Look"! As much as I love to experiment with all of my makeup colors. Sometimes it is nice to buy a palette or kit that has everything you need for a complete look! Plus, these look kits are value priced up to at about $50.00 (for 6 items). I tested out items from the "Sizzlin Summer" Look: 3 shadows (Bright Eyes, Starstruck, and Starlet), 1 lipgloss (Sugar Lips), 1 blush (Sweet Cheeks), and an eyeliner (Onyx). There are more products and shades available in the Summer Collection from the Be a Bombshell site. There are just the items that came in my "Look" bag. Everything came wrapped so cute in a little black bag! The outer boxes and item packaging is girly, yet sophisticated and looks very similar to MAC's packaging. Actually, this whole line reminds me of MAC. Not just packaging, but quality too (Also just slightly less expensive than MAC!). As someone who collects makeup, this line has that "collectable" feel. I just really adore it! In general, these shadows are really great! The texture varies a little bit by shade and finish; but, the pigmentation is great across the board. They are easy to work with and are priced well for the quailty. I do find that I need a primer with these to extend the wear. I really liked getting these 3 shades in a collection together because, quite frankly, I would have never thought to pair these particular shades together into one eye look. Guess what? These colors worked great together! So, I really feel like I was able to branch out from my usual look with these. That is always refreshing! Bright Eyes: A beautiful shimmering gold with subtle flecks of glitter. I found this shadow in particular to be the softest of the group. It is every so slightly powdery. It blends well and the sparkle is a bit less noticeable on the lid. I love this shade as a lid color or all-over wash of color. There is no glitter fall-out. Starstruck: This is a soft medium plum shadow with a hint of shimmer. This color is great in the crease or in the outer corner. It really warms up your look! I find that this shade in particular is a unique paring with the gold lid shade. The pigmentation is really good! Starlet: This is a lovely deep chocolate brown shimmer. There is almost a hint of a blue/green duo chrome shimmer to this. It is not your average brown! The pigmentation of this one is amazing. It applies so well and is not at all powdery. You can use this as a liner or create smoked looks with this! I am really thrilled with the performance of this shade. Sugar Lips: Ohhh! This lipgloss is soooo pretty. It is a light and cool toned milky pink. It is not overly sticky and it has a nice shine. I really can not detect any noticable scent. The product itself is a simple clear tube (and, yes, MAC-like) with a doe foot applicator. This shade of pink really looks paritcularly nice with my somewhat cool toned fair skin. I am reaching for this gloss all the time now! It is a great addition to my makeup collection! Sweet Cheeks: This gorgeous blush is probably my favorite product of the whole assortment! I am a blush fanatic at heart. :) This blush is a soft and subtle cool toned pink with a soft hint of shimmer. I found that this blush has nice pigmentation and is relatively long lasting. What a flattering shade! Onyx: This eyeliner is actually from the main collection. It is a jet black felt-tip eyeliner marker. I the chubby fat wand is easy to manipulate. I find that my success with creating a winged liner look and applying liquid-style liner in general is primarily dependent upon the product! I need a good quality liner that is easy to apply. This Onyx liner by Be a Bombshell totally does the trick! It makes applying liner very easy! The tip is somewhat fat, but it has a very fine point that allows you to control and place your line precicely. The black is super inky and dark. A great liner! Plus, the lid snaps very tight. So, it is not going to dry out quickly. Actually, I have gotten this liner from Be a Bombshell before and have been very happy with it! Ready to "Be a Bombshell"? Interested in checking out "Be a Bombshell"? Just go to their site, fill out a short Beauty Profile survey, and wait for your personalized email with your product selections! Or you can simply order straight from the site. I really like this recent assortment of products that I got from "Be a Bombshell"! 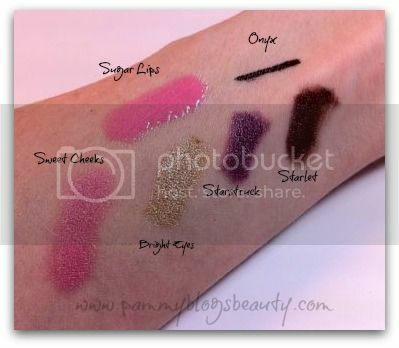 I even found some new faves like the beautiful Sweet Cheeks blush, Sugar Lips gloss, and the Starlet shadow. I love that lipgloss. Amazing products.